B2B event companies don’t often think about consumer spending as something directly relevant to their business. However, consumer trends can allow industry event and exhibition organizers to get an advance view of where the opportunities can lie in the future. In this Keynote address at UFI’s Asia Open Seminar in Bangalore, Devangshu Dutta shares his views about the key consumer trends in India, and the implications for the events and exhibitions industry. 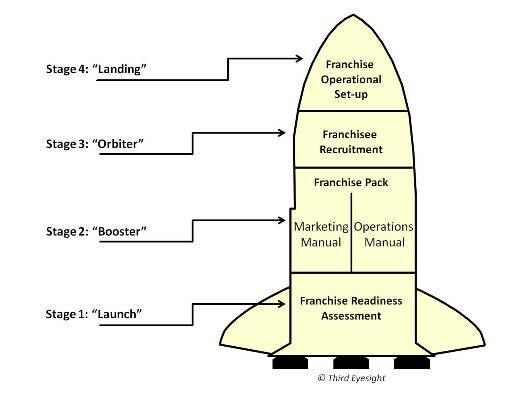 Franchising isn’t rocket science, but advanced space programmes offer at least one parallel which we can learn from – the staging of objectives and planning accordingly. The first and perhaps the most important stage in launching a franchise programme is to check whether the organisation is really ready to create a franchise network. Sure, inept franchisees can cause damage to the brand, but it is important to first look at the responsibilities that a brand has to making the franchise network a success. Too many brands see franchising as a quick-fix for expansion, as a low-cost source for capital and manpower at the expense of franchisee-investors. It is vital for the franchiser to demonstrate that it has a successful and profitable business model, as well as the ability to provide support to a network of multiple operating locations in diverse geographies. For this, it has to have put in place management resources (people with the appropriate skills, business processes, financial and information systems) as well as budgets to provide the support the franchisee needs to succeed. The failure of many franchise concepts, in fact, lies in weakness within the franchiser’s organisation rather than outside. Once the organisation and the brand are assessed to be “franchise-ready”, there is still work to be put into two sets of documents: one related to the brand and the second related to the operations processes and systems. A comprehensive marketing reference manual needs to be in place to be able to convey the “pulling” power that the brand will provide to the franchisee, clearly articulate the tangible and intangible aspects that comprise the brand, and also specify the guidelines for usage of brand materials in various marketing environments. The operations manual aims to document standard operating procedures that provide consistency across the franchise network and are aimed at reducing variability in customer experience and performance. It must be noted that both sets of documents must be seen as evolving with growth of the business and with changes in the external environment – the Marketing Manual is likely to be more stable, while the Operations Manual necessary needs to be as dynamic as the internal and external environment. Now the brand is ready to reach out to potential franchisees. How wide a brand reaches, across how many potential franchisees, with what sort of terms, all depend on the vision of the brand, its business plan and the practices prevalent in the market. However, in all cases, it is essential to adopt a “parent” framework that defines the essential and desirable characteristics that a franchisee should possess, the relationship structure that needs to be consistent across markets (if that is the case), and any commercial terms about which the franchiser wishes to be rigid. This would allow clearer direction and focussed efforts on the part of the franchiser, and filter out proposals that do not fit the franchiser’s requirements. Franchisees can be connected through a variety of means: some will find you through other franchisees, or through your website or other marketing materials; others you might reach out to yourselves through marketing outreach programmes, trade shows, or through business partners. During all of this it is useful, perhaps essential, to create a single point of responsibility at a senior level in the organisation to be able to maintain both consistency and flexibility during the franchise recruitment and negotiation process, through to the stage where a franchisee is signed-on. Congratulations – the destination is in sight. The search might have been hard, the negotiations harder still, but you now – officially – have a partner who has agreed to put in their money and their efforts behind launching YOUR brand in THEIR market, and to even pay you for the period that they would be running the business under your name. That’s a big commitment on the franchisee’s part. The commitment with which the franchiser handles this stage is important, because this is where the foundation will be laid for the success – or failure – of the franchisee’s business. Other than a general orientation that you need to start you franchisee off with, the Marketing Manual and the Operational Manual are essential tools during the training process for the franchisee’s team. Depending on the complexity of the business and the infrastructure available with the franchiser, the franchisee’s team may be first trained at the franchiser’s location, followed by pre-launch training at the franchisee’s own location, and that may be augmented by active operational support for a certain period provided by the franchiser’s staff at the franchisee’s site. The duration and the amount of support are best determined by the nature of the business and the relative maturity of both parties in the relationship. For instance, someone picking up a food service franchise without any prior experience in the industry is certainly likely to need more training and support than a franchisee who is already successfully running other food service locations. Will going through these steps guarantee that the franchise location or the franchise network succeeds? Perhaps not. But at the very least the framework will provide much more direction and clarity to your business, and will improve the chances of its success. And it’s a whole lot better than flapping around unpredictably during the heat of negotiations with high-energy franchisees in high-potential markets. Fail-proof the business plan by focussing on the customer: Focus on the development of retail brands and not solely on quick returns on investment. The primary responsibility should be that of catering to the consumer catchment and driving footfalls for the retail occupants. The other requirements follow from this simple premise. Also, a tenant-unfriendly revenue model that overloads the tenant with a high rent (whether fixed or as a percentage of sales) leads to a churn in tenants, and in combination with other factors, keeps the best tenants out of the mall making it unattractive to customer as well. Offer a good occupant mix: You cannot have mall occupants who have little relevance for the target consumer. Also, the retailers must complement each other in a healthy way rather than cannibalise customers and sales from each other. Ensure good access: Accessibility and connectivity to get the traffic smoothly in and out of the mall is a must; ensure there is adequate parking space. Focus on design: This involves making the mall brands ‘visible’, ensuring appropriate ‘zoning’ in terms of entertainment, multiplexes, kids’ areas, food courts etc. This will result in better customer flow management. Bad design and poor customer flow management within the mall leaves large parts of mall “invisible” to visiting consumers, or improper zoning that confuses customers and breaks up the traffic. Finally, remember, it’s not so much about the “square feet”, as about the feet that will occupy it! Focus on the consumers that you want visiting the mall and why they should return again and again. Many people I know treat shopping centres or malls as a new phenomenon, a progressive development of recent times or a modern blot on the traditional cityscape (depending on your point of view). However, Grand Bazaar (Istanbul, Turkey) is the earliest known mall, with the original structures built in 1464, with additions and embellishments later. But even if one were to get more “traditional” about the definition of a mall, possibly India’s first mall was founded in the hottest city in the country then, Kolkata (New Market) in 1874. In more recent history, Delhi’s municipal pride, the air-conditioned underground Palika Bazar was a novelty in the mid-1980s, while Bangalore’s Brigade Road saw several early pioneers with their shopping arcades in the late 1980s. Then came the mall-mania beginning with Ansal Plaza in Delhi and Crossroads in Mumbai. Everyone started looking at malls as the new goldmine, being pushed ahead by a “retail boom”. The early stage of any such gold rush usually has several experiments missing their mark, which is what has happened with the hundreds of mall-experiments that have been launched in the last 7-8 years. Some of the significant and common issues are starting to be addressed, but many others remain. The top-most issue in my mind is “oversupply”. While this may sound absurd to many people, given the low figures quoted for modern retail, I am referring to the over-concentration of malls in a small geography. If 8-10 malls open 4-5 million sq. ft. of shopping in a catchment that can only support 1 million sq. ft., everyone knows that some of the malls will fail. But everyone also believes that their mall will succeed (otherwise, they would obviously not have invested in the mall). What happens to the malls that fail? Depending on the design of the building, many of them can be repurposed into office space – another area where a lot of investment is still needed. So in the end, actually, most people win, one way or the other. Yet, there will be some losers. Does anyone “plan” on being one? The second key issue in my mind has been that mall developers have been thinking as “property developers” rather than retail space managers. 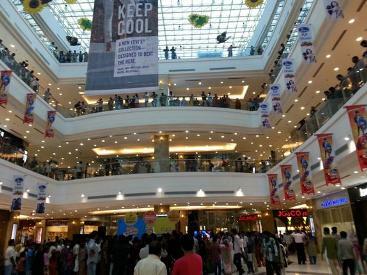 The successful shopping centre operators worldwide (now also in India), are actually as concerned about what and who is occupying that space as a retailer would be. They are concerned about the composition of the catchment, the shopping patterns, the volume of sales, the shopping experience. Therefore, the tenant mixes as well as adjacencies are factored into the earliest stages of planning the shopping centres. In fact, if I were to identify the most critical operational problem for many of the malls, it is the lack of relevance to catchment and, therefore, the low conversion of footfall into sales for the tenants other than the food-courts. Customer flow planning within the mall is another factor that can make a tremendous impact on the success and failure of the tenant stores. Once you start looking at these factors during the planning of a mall, another obvious aspect that jumps out is “differentiation”. Currently, there is little to choose from between malls (other than possibly the anchor store). However, with more clarity in terms of the target audience, the potential strategies for differentiation also become clearer. The visitors also become segmented accordingly, and there is a natural benefit to the tenants occupying the mall. If, as a mall operator, you want to be in business for long, and also develop other properties in the future, the success of your tenants is probably the most critical driving factor for your business. When we gauge malls from the perspective of integrating within the urban landscape, there are obviously some glaring errors being made. Instead of aesthetic design that reflects the heritage and culture of the location and its surroundings, or some other inspirational source for the architect, most malls that have come up are concrete and glass boxes. Beyond the looks, some of the malls are a victim of their own success. They attract more crowds during the peak than they have planned for. Not only does the parking prove to be inadequate, there is no holding capacity for cars entering or exiting the mall. The result is a traffic nightmare – not just for general public, but even for the visitors to the mall. Someone who has spent 45 minutes stuck in a jam waiting to get into the parking of a mall will certainly not be in the best frame of mind to buy merchandise at the stores occupying the mall. Some of the problems lie outside the mall-developer’s control – for instance land costs are a major driver of the cost of the project (and, therefore, the lease costs to the tenants), and land is a commodity which is independent. Real estate is available within the cities as brown-field sites (former industrial locations), but the regulations are convoluted and the strings are in the hands of too many different departments of the government (city, state and central). This needs joint creative thinking on the part of developers, the government and the public, if our cities are to develop in a more sane fashion than they have in the past. Similarly, land deals are still not clean enough for foreign investors to be comfortable participating in many developments. This obviously is holding back a tremendous source of capital and domain expertise that could contribute to the growth of this sector. Many other operational issues exist – manpower, systems, health & safety – some of them can be managed or controlled by the mall developers, and it is a question of time (and of their gaining experience). Other issues are more in the domain of the government, and need a visionary push to make “urban renewal” a true mission. In my opinion, one of the most interesting areas which would be in the joint interest of almost all parties (that I can think of) is the possibility of revitalizing the high streets and community markets, and reinventing them as the true centres of shopping. Many of our markets are rotting (a strong word, but let me say it anyway). The individual stores are owned by individual owners who are not all equally capable of maintaining the same look and feel throughout. The infrastructure in and around the markets are owned or managed by several different agencies. To make matters worse, there is often no cohesiveness and no synergy in the interests of most of the members of the market association. None of these individually have the power or the mandate to recreate the shopping centre. But what if they could get together and take the help of a re-developer? If an example is needed, New Delhi’s Connaught Place provides the example of one stage of redevelopment. Connaught Place had lost its pre-eminent position as a shopping centre, due to the spread of Delhi’s population and the new local markets that had come up. Further disruption was caused by the construction by Delhi Metro. But DMRC has reconstructed an “improved” centre, and the Metro connectivity has made the customers come back into CP, as it is affectionately known in Delhi. There are clearly many such opportunities around India’s cities. These need to be looked at as a commercial opportunity for all concerned (revenue for the redeveloper, better sales for the store owners / tenants, more tax revenue for the government from additional sales and consumption). But it is also a broader social opportunity to breathe a new life into our cities, and to make them proud beacons of a growing India. It would be a mission that would truly prove the worth of shopping centre developers, urban planners, regulators and the retailers themselves. Are investors ready to get malled? Mall Mania, Mall Madness – alliterate as you will – it’s a phenomenon that is certainly taking over the newsprint, airtime and, quite possibly, your neighbourhood. A study published in 2005 estimated that by 2007 over 360 shopping centres would be operational around the country, with approximately 90 million square feet. A meagre increase of 0.08 sq. ft. in per capita shopping space doesn’t seem like much in a country of a billion-plus people. But most of it is concentrated around the big cities – Delhi and Mumbai account for more than half of the total space projected, with the other metros and mini-metros such as Bangalore, Pune, Hyderabad etc. taking the total up to 90% of the space. One may argue that money (real estate development) is only following the money (consumers) – after all, there are more consumers and higher incomes in these major urban centres. But why would mall developers expect Delhi’s consumers to suddenly switch en-masse to shopping in Gurgaon, where 6 malls are already active in a short distance of about a kilometre, 3-4 more under hectic construction in the same area and several more scattered around that suburb? Or why do Mumbai’s developers expect people to drive several kilometres from the suburbs on a regular basis to the centre of town to grace only their shopping centre? It is only such expectations that can explain the gold rush mentality that is overpopulating certain areas with shopping centres and malls. While per-capita availability of A-grade shopping real estate looks really low, in certain areas we foresaw oversupply, with developers thinking in terms of “property” rather than as retail space managers. Most shopping centre developers have carried out only cursory studies on the customer catchments that their tenants will be expected to live-off. As a result, conversion of footfall into sales is low for the tenants, except for food-courts, which are benefiting from the window-shoppers rounding off a day or an evening of roaming the malls with a meal. There is a lack of differentiation in product and service offer between the shopping centres and, with nothing distinctive on offer, repeat visits and – more importantly – repeat purchases are a challenge. Developers in smaller towns seem to be following the same model, scaling up space or scaling it down based on the capital cost vs. expected capital gain and tenancy income. They are pitching for much the same brands as tenants as the developers in the bigger cities. There is competition for customer traffic between the shopping centres and large stores (such as Mumbai’s newly opened Hypercity, across the street from InOrbit Mall, both developed by the Rahejas), between the shopping centres and the traditional high street, and between large format stores and speciality malls. For the most part shopping centre development in India in the recent years has been seen as an aspiration to be fulfilled – hence, the most important factors have been the size of the shopping centre, quality of fixtures, marquee tenants who can provide the glamour or the legitimacy). The focus has been more on the “positioning”. The business will begin maturing and will begin taking developmental leaps forward when centres are seen as commercial infrastructure to be planned with the end-consumer in mind, and to be serviced over a certain lifetime. Until then, we can look forward to announcements of many hundreds of shopping centres, the launch of a few hundred, and the conversion of many of those into uses other than as shopping centres within a few months or years of their launch. And for investors also it might be a game of Roulette rather than Patience.